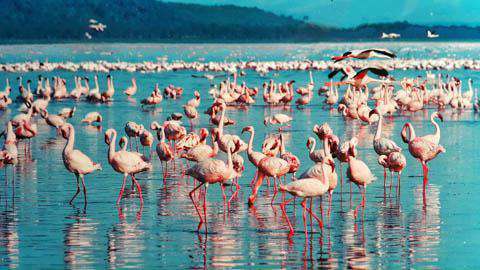 How much does it cost to travel to Lake Nakuru? How much money will you need in Lake Nakuru? The average price of food for one day is KES1,206 ($12). Additional pricing is in the table below. These average travel prices have been collected from other travelers to help you plan your own travel budget. How expensive is Lake Nakuru? Lake Nakuru is one of Kenya's 23 National Parks, also qualifying as one of the two Premium Parks in the country. Located in central Kenya, about 90 miles west of Nairobi, the area encompasses a large lake as well as the surrounding wooded grasslands. A naturalist's paradise, Lake Nakuru is home to wildlife like flamingos, other water birds, and the black and white rhinoceros. The sights of Lake Nakuru National Park consist mainly of the native wildlife and natural scenery. While flamingos and rhinos steal the spotlight, the park is home to a total of at least 56 species of mammals from monkeys to lions to zebras, at least 400 species of birds, and over 500 species of flora. The landscapes are varied and beautiful with peaceful grasslands and dense forests. The park does have an entry fee of $80 U.S. dollars for nonresident adults and $40 for children. As far as scenery goes, the best overlooks in the park can be found at Lion Hill near the Sarova Lion Hill Game Lodge, Baboon Cliff with a great view of the lake and its wildlife, and Out of Africa, a rocky outcropping just a bit higher than Baboon Cliff and less frequented by tourists. From these lookouts, visitors might also catch sight of the volcanoes Suswa and Longonot. Each one is established and can be reached by car. Other lesser viewpoints include Enasoit, Honeymoon, and Lion Ridge. Nukuru town is the nearest hub for shopping and dining just outside the park. Situated between Nairobi and Western Kenya, it acts as the headquarters for the Rift Valley Province as well as a prime transit city for many travelers. As far as food goes, Nukuru is the fourth largest city in Kenya and so has a variety of options from local cuisine to international fare. In regards to shopping, the city is a center for various retail businesses, but there are also locals who sell souvenirs to visitors for a price about 1/3 of the amount you would pay at a lodge gift shop inside the National Park. Nukuru town is definitely a place where you can find the best bargains. A large public market lies to the west of the town on the main thoroughfare to the capital, Nairobi. Being a National Park, Lake Nakuru is a hub for outdoor activities. Whether you wish to observe the local wildlife, breathe in the air of African wilderness, or admire the natural landscape, the park is a treasure trove of the great outdoors. Camping and picnicking are very popular, though you must make sure to have all the supplies you need before entering the park. It is also a hotspot for photography, drawing amateurs and professionals from all over with its unique habitat for all things wild. If you're a bird-lover, you will be in birdwatching paradise. Flamingos take the stage with their presence in the lake, but there are about 400 species of bird to catch the eye from ostriches and ducks to stork, heron, osprey, and eagles. The list goes on. Rhinos are also common if you're on the lookout for wildlife, and you might even spot lions, leopards, or cheetahs. Game driving is another popular activity in the park that might give you a better chance to see the more elusive animals. The best way to enjoy the great outdoors and still get your meals in is to bring food with you and eat picnic style. If you are camping, you will definitely want to come fully stocked. However if you want to splurge, any of the park's lodges will offer a buffet or a la carte menu for an average price of $40 per person. Some even have poolside bars if you're looking to kick back for happy hour. In the nearby Nukuru town, restaurants serve a variety of options from Western to African. Most African staples include maize (a type of grain) served with meats and vegetables, as well as corn, potatoes, and beans. Ugali is a cornmeal starch made into a thick paste, Sukuma wiki is collard greens and usually fried in oil with onions and tomatoes, and nyama choma is the East African style of slow roasted meat over coals. Some restaurants in Nukuru include Ribbons for budget African food, Taidys for mid-range mix of Western and African fare, and the Merica Hotel for upmarket Western cuisine. If you are arriving by air, it's about a 25-minute flight from Jomo Kenyatta International Airport in Nairobi to the Naishi airstrip inside the park. Once you are in the park, the best way to get around is by car. Most of the park's roads are well maintained and can be navigated easily by 2-wheel-drive vehicles. The Naironi-Nakuru highway is the most direct car route from Nairobi, and is very scenic once you reach the confines of the park with views of the Rift Valley and surrounding volcanoes.